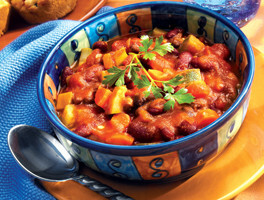 The beans and veggies in this dish make it a great source of fiber with 10 grams per cup. The recipe makes 8 servings, so save leftovers for a delicious lunch the next day. Add onion and carrots and sauté 5 minutes. Add green pepper and zucchini and sauté another 2 minutes. Add garlic and sauté 30 seconds. Add chili powder and all remaining ingredients; bring to a boil. Cover, reduce heat, and simmer 30-35 minutes or until the vegetables are tender.